The brilliant red background of this fresco fragment enlivened the interior space in which it was painted. X-ray fluorescence analysis has revealed that this red color contains iron oxide, which suggests that this pigment derives from red ochre – a popular pigment found in Roman wall painting. When ochre is heated, water evaporates and leaves a fine red powder, which can then be applied to wet lime plaster to create this deep-red shade. The golden column, crowned with a Doric capital and adorned with a band of green triangles around its circumference, supports an architrave, or lintel block, of a building. The capital and the architrave were, most likely, architectural elements of an aedicula, or small shrine. Such allusions to civic architecture constitute a common motif in Roman wall painting. 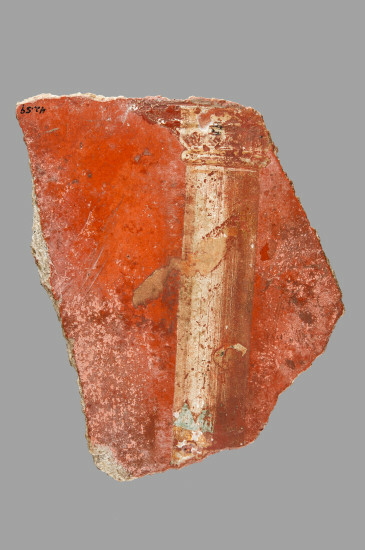 We can compare this fragment to both the frescoes from the “Red Room” from the villa at Boscotrecase, and also to the red fragment from Room 19. The radiant red color of the walls of these rooms and the architectural elements of its paintings resonate with the composition of our own fresco fragment.